The FIU Art+ Art History Department is collaborating with the FIU Robert Stempel College of Public Health & Social Work, FIU Student Health Services, Baptist Health Systems, and the Miami-Dade AHEC (Area Health Education Center) to bring What the Duck?! to the FIU Modesto A. Maidique Campus. What The Duck?! 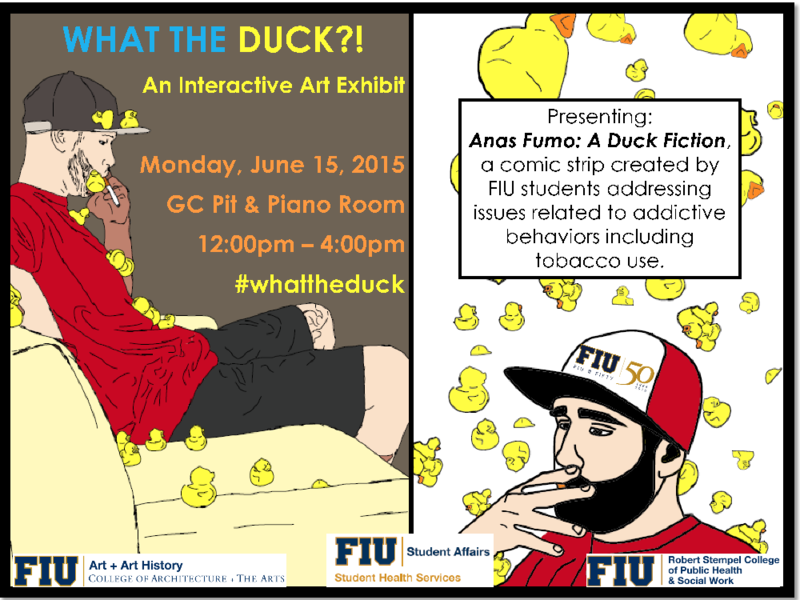 is an interactive art exhibition, presenting “Anas Fumo: A Duck Fiction,” a comic strip created by FIU’s Community Comic Book Class taught by Gretchen Scharnagl (Instructor, FIU Honors College / FIU College of Architecture + The Arts). During the exhibition, Health Communication students from the FIU Robert Stempel College of Public Health & Social Work will be providing free giveaways and addressing issues related to addictive behaviors, including smoking and tobacco use. What The Duck?! will take place on June 15th, 2015 from 12PM to 4PM in the FIU Graham Center Pit and the Graham Center Piano Room: 11200 SW 8th Street, FIU Modesto A. Maidique Campus, Miami, FL 33199.